Salam & hello everyone! Im excited for this post because i freaking love this mascara and I cant wait to share with you guys! Its a mascara from Mary Kay called the Lash Love Mascara. Let get on with my thoughts on it! It defines, defends and delivers four times the volume without looking overdone. Everything a girl desires in her perfect everyday mascara is a twist and a flick away with Mary Kay® Lash Love™ Mascara. The flexible, sculpted brush works with the water-resistant formula, which is enhanced with the exclusive Panthenol Pro Complex and vitamin E to help moisturize, strengthen and condition lashes to defend against breakage and brittleness. You get lashes that appear fuller, lifted, multiplied, while looking naturally flawless, soft and healthy. No stiff spots or clumps in sight. And lashes look rich and beautiful, thanks to strong pigments which provide a deep, true color. Packaging: Its made out of a very hard plastic, glossy matte kinda packaging. Very high quality and pretty sleek. Effectiveness: The wand it self is really easy to control and it definitely separate my lashes effortlessly. Lashes look longer in just a few swipe. I use a zig zag motion to volumize my lashes more. It may look clumpy after a few much using it due to air stored in the tube. Longevity: To my surprise, my lashes curls up for a very very long hours. This is the part where I feel in love with this mascara. It does not smudge and it last very long. Scent: No overpowering or weird smell. Ease of Use: Easy to use and the size of the brittle on the wand makes its easier to apply both upper and bottom lashes. I love this mascara. This would be one of my favorite mascara and totally recommend to others. If you are looking for a mascara that give you longer lashes, separate your lashes beautifully. Buy this! I like to give a lil touch up to my lashes, where when it dries, I curl them again, and it lash for a very long hours. As you can see in the picture, for me its not to volumizing but it does brings out nicely especially in pictures. Bottom lash looks much more longer and neat. It is also not very hard to remove and waterproof. Just perfect! Love this mascara so much! This one looked very good! 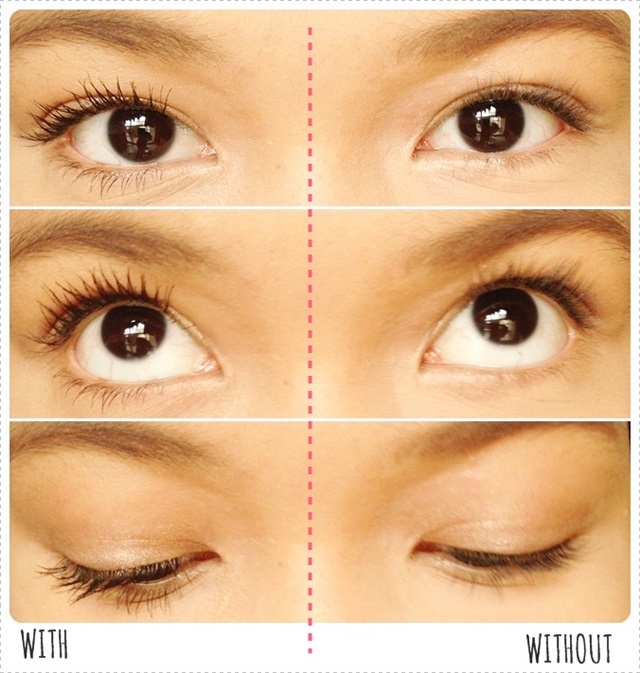 No clumps, separates the lashes well and most importantly looked very natural as some people like it to be. "me! me!" yep! mmg best mascara ni! uik rm75 ya... erm erm hihi tapi memang mcm best ni..kena lg bulu mat berhambur cam saya :) nice review! wah, 75? erm.. tp cantik... item must try nih.. ehee..